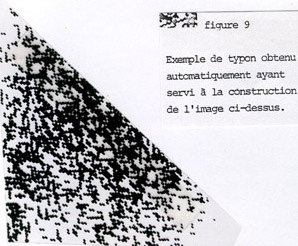 To improve the sharpness of the colored point obtained by the method of punch cards stencils, Hervé Huitric had the idea of a new usage of the available plotters in the 70s. The idea was to use a plotter with the black color, to produce opaque, translucent masks allowing the usage of the silk-screen printing. This method also had the advantage to be faster than the previous processes, and to allow permutations of color easily, just by switching the inks of screenprintings. We were able to realize ourselves these screenprintings in a professional studio of artistic screenprintings which allowed us to go to nine masks giving a wide range of colors. With the same algorithms of calculation of colors, it was necessary to adapt the previous programs to this method. Instead of decomposing the color into "pure" colored constituents, for example Red, Green, Blue, it was necessary to decompose the color into constituents required for screenprinting printings, for example cyan, magenta, yellow (what was less simple). 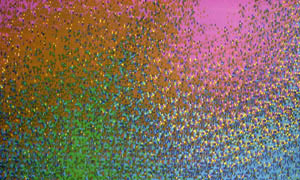 For every color, the program produced a binary map made of 1 and 0 to express the presence or the absence of the color. Then by using a transparent paper for the plotter, we obtained a black point in places corresponding to the absence of color. After light treatment and reproduction on silk, we recovered the screenprinting masks ready-to-use. extrait du Doctorat d'Etat d'Hervé Huitric: chapitre 1, page 50, figure 9.